MADAM CHANCELLOR, after completing graduate studies in Social Planning and Demography, Michel Sidibé unleashed his passion for advancing global health in his native Mali, where he took up the cause of the nomadic Tuareg people. His tireless efforts to improve their health and welfare evolved into a role as the country’s director for the international development federation, Terre des Hommes. In 1987, Mr. Sidibé joined UNICEF in the Democratic Republic of Congo. In his 14 years at UNICEF, he oversaw programs across 10 francophone countries in Africa, where his numerous leadership achievements included pioneering the continent’s first movement for girls’ education, and negotiating the successful release and rehabilitation of child soldiers from the Eastern Congo. In 2001, he joined UNAIDS, the joint United Nations Programme on HIV/AIDS, where he has played a key role in fighting to preserve human rights, particularly for the millions of men, women and children affected by HIV/AIDS in developing countries. In 2009, he was named Executive Director of UNAIDS and Under-Secretary-General of the United Nations, and committed to supporting countries to achieve universal access goals to HIV treatment, prevention, care and support. Based on a strategy pioneered at the UBC-affiliated British Columbia Centre for Excellence in HIV/AIDS, Mr. Sidibé’s bold new initiative calls for the expansion of antiretroviral therapy coverage to end AIDS related morbidity and mortality and the spread of new HIV infections. An influential advocate, Mr. Sidibé has strengthened UN reform and plays a key role in strengthening collaboration with numerous global partners, including the United States President’s Emergency Plan for AIDS Relief and the Bill and Melinda Gates Foundation. 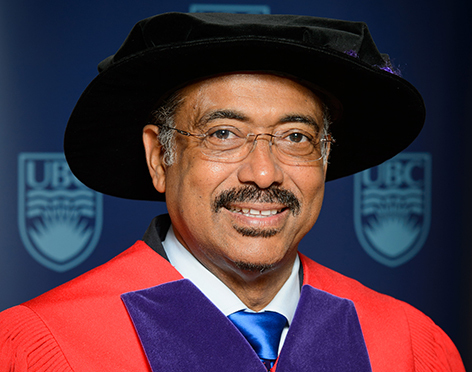 Madam Chancellor, in recognition of his extraordinary record of international public health service, and for his leadership in catalyzing the global movement for universal access to HIV/AIDS treatment, prevention and support, I ask you to confer the degree Doctor of Science, honoris causa, upon MICHEL SIDIBÉ.